Just click on the GO or something on the right side of the test. It gives me an error. If you find a solution Iet me know my friend..
Is it possible to use WC stadiums in the career mode? Is it possible to assign them to clubs? I changed something at Competitions in DA. When I'm trying save I'm getting "Object reference not set to an instance of an object" error. First of all, thank you very much for this tool, excellent work. 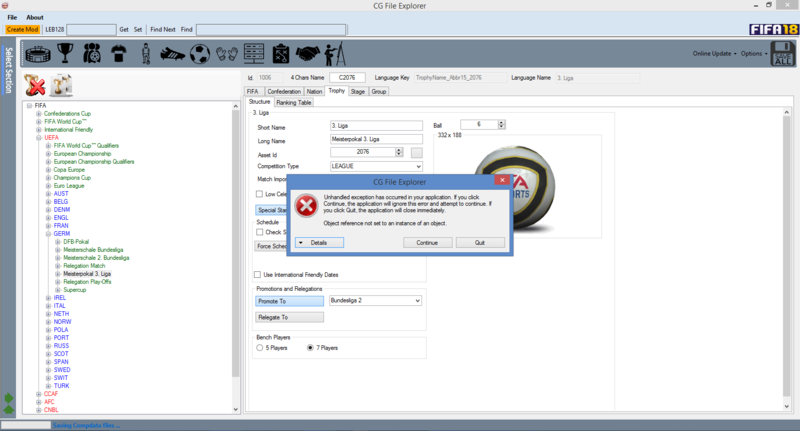 After using CF File Explorer 18, and when trying to use Fifa 18, it does not start. Does anyone have any idea about it? The same thing happens with Frosty Tool Suite. If I play the program without using any of these tools, then it runs perfect. Thank you, for the help you could give me.